Big Data can provide new efficient decision making tools for helping agricultural development as well as biodiversity protection. New acquired, aggregated and shared data is a breeding ground for extracting and sharing useful information and knowledge among different actors involved in agriculture or biodiversity domains, as well as for combining large data sources (thus obtaining new data sources) with advanced crop and environment models to provide actionable on-farm decisions. When you're trying to reach a goal, data not only tells you if you're succeeding, but it also suggests which activities you should do more of in order to improve your results (Bill Gates). A collection of data sets so large and complex that it becomes difficult to process using on-hand database management tools or traditional data processing applications. The challenges include capture, curation, storage, search, sharing, transfer, analysis, and visualization (Wikipedia; mike2.0 Big_Data_Definition). BigDdata is big news. But what is Big Data, and how do we use it? Simply put, Big Data is data that, by virtue of its Velocity, Volume, or Variety [and Veracity: the four V’s of Big Data], cannot be easily stored or analyzed with traditional methods (Techniques and Concepts of Big Data). Analytics is a helpful tool to extract knowledge from Big Data, i.e. to gain insights from data and make decisions by applying analytical methods from mathematics, statistics, data mining, machine learning, etc. Through usage of common ontologies increasing interoperability between heterogeneous data sets, Semantic Web (a machine-understandable Web) is ideally designed to work in heterogeneous Big Data environments (the current freely available Semantic Web data counts 90 billion triples in over 3,300 datasets). SBD 2016 : International Workshop on Semantic Big Data defines ‘Semantic Big Data as the intersection of Semantic Web data and Big Data. There are masses of Semantic Web data freely available to the public - thanks to the efforts of the linked data initiative […] Hence not only Semantic Big Data is freely available, but also distributed execution environments for Semantic Big Data are freely accessible. This makes the Semantic Web an ideal playground for Big Data research’. The UN Data Revolution Group refers to the transformative actions needed to respond to the demands of: a complex development agenda; improvements in how data are captured and used; building capacity and data literacy in ‘small data’ and Big Data analytics; modernizing systems of data collection; liberating data to promote transparency and accountability; and developing new targets and indicators. Agro-produce includes crop, horticulture, livestock and fisheries. Complex data and crop health variability are classic examples of Big Data sources. Agriculture is affected by various factors including soil, climate, seed, cultivation practices, irrigation facilities, fertilizers, pesticides, weeds, harvesting, post harvesting techniques, etc. Agricultural companies, governments, organizations, researchers (from academia and industry) generate, maintain and use huge amount of data related to agricultural production, weather and climate, insurance, marketing, supply chain, packaging, distribution, etc. Big Data has been providing a useful tool ‘to ensure that each year we are improving our production plan. Small increases in adopting change on the farm can lead to significant long term success […] Every producer enters spring with the best plan for their farm based on the information they have available […] Increase value derived from traditional on-farm data sources: leverage knowledge from planting, fertility, and yield maps to make better input decisions’ (Big Data in Agriculture). Big Data and its benchmarking (see : Big data PPP: Support, industrial skills, benchmarking and evaluation 2016-2017, European Commission) can be seen as one of the major building blocks for effective decision making for farmers, policy makers, companies involved in agri-business and agro-inputs, banks, insurance companies and service providers. The multi-modal nature of the data presents several challenges such as improving methods for data collection, effective and time efficient statistical and data analytical techniques to understand and support the functions of various agricultural verticals. Not only the integration and interoperability among these Big Data sets, but also the semantic and contextual interpretation of them is very challenging from generation of time critical and context specific information, alerts and messages. Food security, sustainable agriculture and forestry, marine and maritime and inland water research, and the Bioeconomy is the second (SC2) of seven Community Societal Challenges established under the BigDataEurope Project (BDE) (funded by the Horizon 2020 programme). A budget for the SC2 Work Programme - which has undertaken foundational work to manage, publish and use large-scale of data - is around €877 million. Food and Agriculture (large-scale distributed data integration) is represented in the consortium by FAO of the United Nations and Agroknow. One of the expected results of this Societal Challenge is to contribute with open research data generated to the Open Research Data Pilot (along with a well-defined Data Management Plan; Get the description of the Data Management Plan directly for your proposal!). Research data specific to agriculture (e.g., genotype data, phenotype data, spectrophotometer data, sensor data, images etc. and many more types of data that need to be translated and integrated into tables, diagrams and other visualized ways in order to present information in a simple and meaningful way) should explore how advanced data discovery, processing, combining and visualization from distributed and heterogeneous data repositories can be supported in agriculture. Among ninety five expected impacts (in view of Big Data processing optimizing the whole agricultural process) - listed in the Work Programme 2016 – 2017 of the above mentioned second Societal Challenge - those concerning agriculture include: activities supporting the adoption of productive and resilient agricultural systems which capitalize on the benefits of high plant species diversity; introduction of plant properties that respond to new challenges and demands while also taking into account growers' economic returns; activities significantly strengthening European capacities for the conservation, management and use of in situ genetic resources; increase in the safety, reliability and manageability of agricultural technology, reducing excessive human burden for laborious tasks, etc.. The first BigDataEurope workshop on Big Data for food, agriculture and forestry: opportunities and challenges took place in Paris, on 22 September 2015(the full report is available here: BDE-SC2-1st-workshop-Finalreport). This workshop was organized by Agroknow, FAO and the BigDataEurope project in the context of the Research Data Alliance 6th Plenary Meeting. Overall, what came out of the discussions was that the special thing about Big Data in agriculture is its extreme variety: this is what you get, if you contrast the four V’s of Big Data (Volume, Velocity, Variety, Veracity) to the data types and sources that are typically used in agricultural and food research. In food and agriculture, data variety matters the most: you need to combine multiple, heterogeneous data types and formats from several sources, trying to solve the information problems and support decision making of the relevant stakeholders. The discussion indicated that it will be important for the BDE project to more precisely understand the order of magnitude of the data types discussed in this workshop (e.g. streaming data over decades, genomic data…) and the actual need for big Data technologies. Further information, events and results of the BDE project can be monitored on the BDE website: http://www.big-data-europe.eu/. During the SEMANTiCS Conference hold in Vienna, in 15-17 September 2015, the SemaGrow project presented the SemaGrow stack (see http://143.233.226.42:8080/SemaGrow for an online-version) as an answer to the integration needs (Big) agricultural data in practice. The SemaGrow stack is a distributed infrastructure layer on top of existing data repositories and networks that supports the interoperable and transparent application of data-intensive techniques over heterogeneous data sources. To help reaching the Sustainable Development Goals, a global agriculture research partnership for a food secure future (GCIAR) has tapped into Big Data. Within the programme on Climate Change for Agriculture and Food Security (CCAFS), researchers have already applied Big Data analytics to agricultural and weather records in Colombia, revealing how climate variation impacts rice yields. After defining its Open Data-Open Access strategy, CGIAR has launched an internal call for proposals for Big Data analytics platforms that will provide services to the Agri-Food system programmes and partners, and will interconnect the CGIAR data to other multi-disciplinary Big Data. The project BIg Data for Agriculture and biodiversitY (BIRTHDAY) aims at providing new efficient decision making tools for helping agricultural development as well as biodiversity protection in Peru. More specifically, it aims at developing a new platform for helping to acquire new data, to share data, to extract knowledge, and to share useful information and knowledge among different actors that are involved in agriculture or biodiversity domains in Peru. In order to identify and document the key stakeholders and their relevant initiatives in Big Data in the agri-food sector, UN FAO, Agro-Know, GODAN , Alterra WUR and other partners have joined forces in order to map the current status and future challenges on Big Data sources and technologies in the domains of Food Security, Sustainable Agriculture and Forestry, Marine and Maritime and Inland Water Research, and the Bioeconomy. Do you agree that Big Data means Big Development? What barriers are still exist to extract and harnessing agricultural data to address the complexity of modeling and simulations? 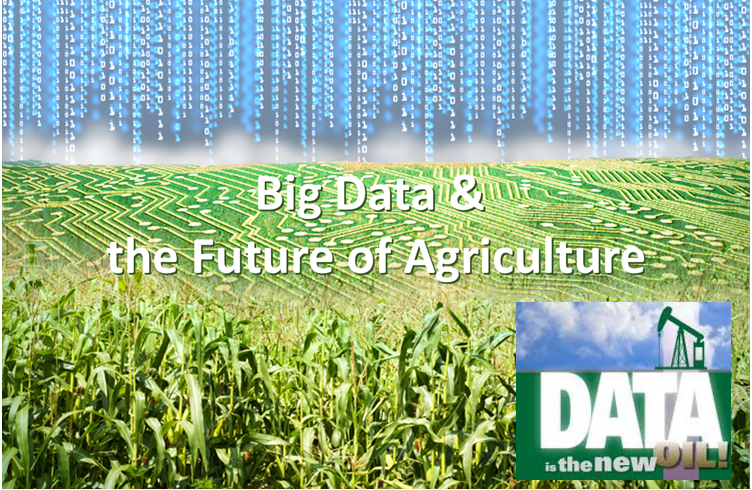 Tell us what you think about Big Data (also in Agriculture! ): we would be interested to hear from you here!